Of this SIX MONTHS, we only met and managed to spend some quality times together for NINE DAYS. However, I guess it's still not bad right? So far, we managed to meet each other every after a month plus. We've met once on the November and December, and yes this end of January too. The difference of our age gap only 2 years. I went to Selangor and he also came Sabah before this. Both Selangor and Sabah were within Malaysia, but hey we still need to take the plane to get to meet each other! He is fleshy!! I is skinny!! Don't you agree with that statement? If you read our first-monthsary posts at HERE and HERE, you will certainly know how opposite our characters were. However, despite of those differences, we do have something in common too! That's make us happy to be together! It will never leave us, I guess that is something needed in relationship too. There's one time when we argued and I just ignored him for the entire night. Wifey, I’m sorry that you had go through all this. You don’t deserve this sort of treatment from me. You don’t deserve it at all. I’m sorry for hurting you. I promise you that I will really try my best to control my mood. Im sorry and really love you very much. I promise to try my best so we can live happily k. Hugs. Miss you very very much. Tolerance is crucial in a relationship too! You will never know how our temper can be, and tell you that sometimes our anger manipulate us. Yet, am still glad both us still know how to tolerate with each other after this long. Sorry, I just will never get enough from this. Insecurities never stop haunting me, all thanks to my past long distance relationship experience. But, I'm still trying my very best to deal with this feeling. Dear Eric, he just never stop comforting me though he is quite disappointed with me at times. Thanks for all the precious moments especially when we're together. Thanks for loving me of course. I'm happy to know that you love me more and more each days. I myself too! Love you deeper and deeper as time goes by. Hopefully there are more and more anniversaries for us to celebrate together! 6 months already? Gee! You make it sound like a pregnancy... Muahahahaha!!!! Congrats! yayks!! !happy monthsary to both of you!!! yeah!i super agree with those quoted inside the boxes!!! stay strong the both of u!!! @Eric Lee chopped! :P glad u like it! okie lets work it out together! hugs! @suituapui Heiyer!! wont so early get pregnant one la! hehe thanks STP! 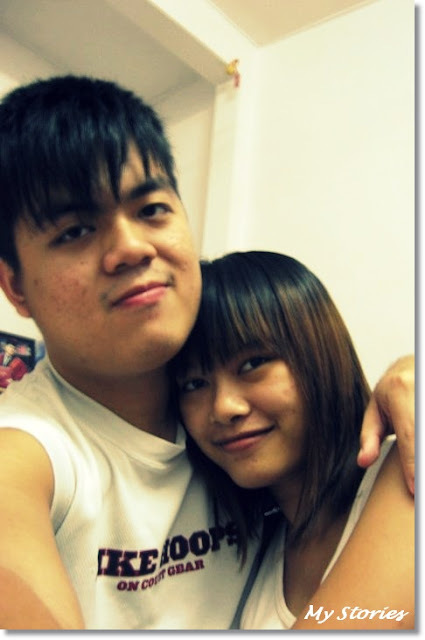 ar..so sweet~~Long distance relationship really not easy, gambateh! happy sixthmonsary. long distance relationships do work. yeah, i think you are very right, there's really a lot more things to be taken care of for long distance relationship..
it's the effort on both sides to make the relationship work. Huh at first I read six month salary? Thought you dapat 6 month bonus wowie You guys so slow one the new Y Gen should be fast mah. Got a friend met her hubby sharing table *tub toi* eating har mee, exchanged name card dated few times, correspond letters as hubby working overseas *no email those days* then got married and lived happily ever after. Geng leh? this is such a sweet post. congratulations to the both of you for keeping your relationship strong for half a year. wish you more years of joys and love to come. don't worry about the age. 2 years is so ordinary. ours is almost a dozen years! LOL! WOW! This is such a sweetie post! Happy 6 monthsary! Cheers to more years of togetherness! Wah. Happy Happy SIX-Monthsary. Hope everything will sail smoothly. Hope you reach the end of your journey happily though the sea may be rough plus those heavy thunderstomes. yes yes hope can spend more time with u also this coming feb! yay! @LainyThanks Lainy! :D hugs too! I'm sure you will have many more special days, months and years with him! p.s. thanks for visiting my blog and your kind comment! Congrats to you and your beloved. May your relationship last a lifetime. Hi Caroline It does not matter the quantity of time spent together. I think the quality is more important. The way i look at it as long as you truly love each other then nothing or no one else matters. Happy 6 months my friend. Lunch at Cawan Cafe, Beverly Hills. Am No Longer a Sagittarius but OPHIUCHUS ! Everything Fresh for My Stories! Happy Birthday to you, dear Eric.